“The concern that people are going to get on these flights and fly from West Africa, where these cases are, to anywhere in the world is … a real possibility,” said Dr. Sanjay Gupta, CNN's chief medical correspondent. Earlier this month, a Liberian government official who had Ebola symptoms collapsed after getting off his flight in Lagos, Nigeria on July 20. Patrick Sawyer, 40, died five days later. He had been taking care of his Ebola-stricken sister, in Liberia, although he didn't know she had the disease, his wife told CNN. At this point, the World Health Organization does not recommend any travel or trade restrictions on Guinea, Liberia, or Sierra Leone. While the Centers for Disease Control and Prevention (CDC) acknowledges it's possible a person infected with Ebola in West Africa could get on a plane and arrive in another country like the United States, the chances of the virus spreading during the journey is low. He added that most people who have become infected with Ebola lived or cared for an ill patient. “It is highly unlikely that someone suffering such symptoms would feel well enough to travel,” IATA said in a statement. 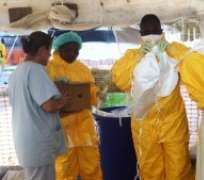 The UK Department of Health said in a statement that it is monitoring Ebola, but that the risk is still low for British citizens. “We do not, at the moment, think this is an issue that affects the UK directly,” said Foreign Secretary Philip Hammond, who held a high-level meeting about the disease on Wednesday.